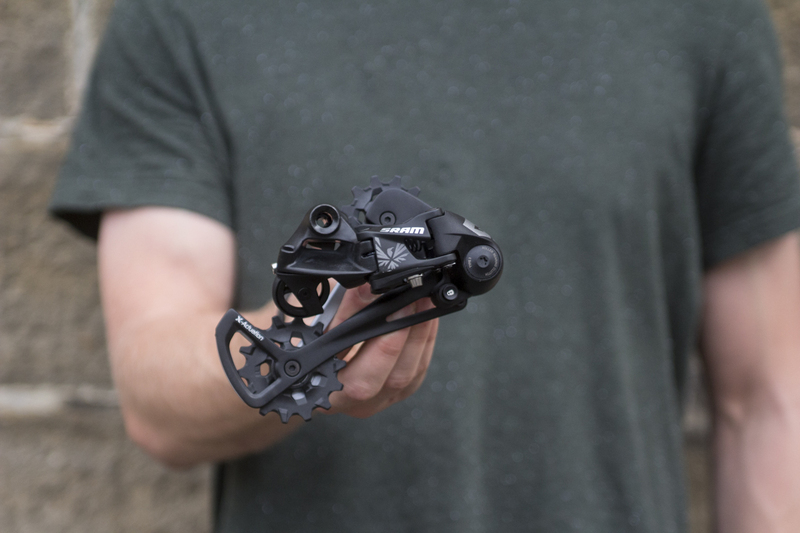 After introducing the wildly popular XX1 and X01 1×12 Eagle groupsets just over a year ago, American mega-brand SRAM has just thrown down its next move in its ongoing drivetrain war with Japanese rival Shimano. 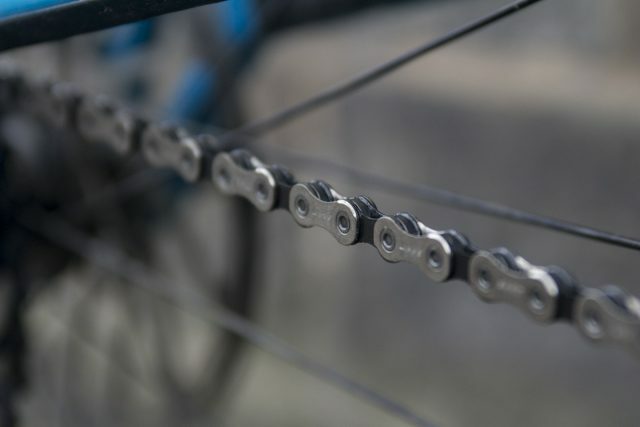 But rather than trickling its 12-speed technology down to the X1 level as many had assumed it would, SRAM has skipped the X1 level and gone straight to GX. And so after many weeks of keeping our lips sealed, we can now finally talk about the brand new 2018 SRAM GX Eagle 12-speed groupset. 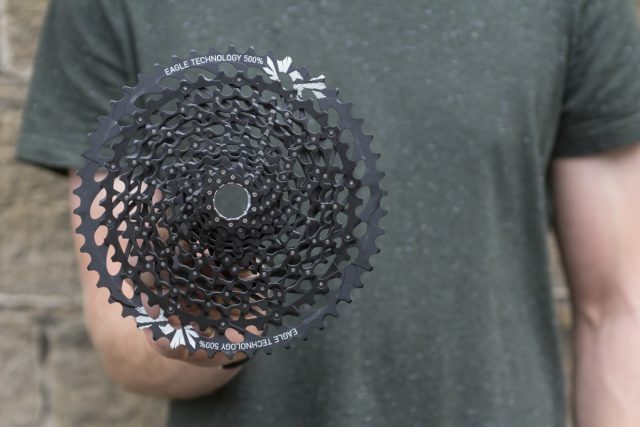 SRAM has skipped X1, instead trickling the Eagle 1×12 technology straight to the GX level. But first, why GX Eagle? Why not X1 Eagle as many had assumed SRAM would do first? The answer to that question lies in the OEM market. 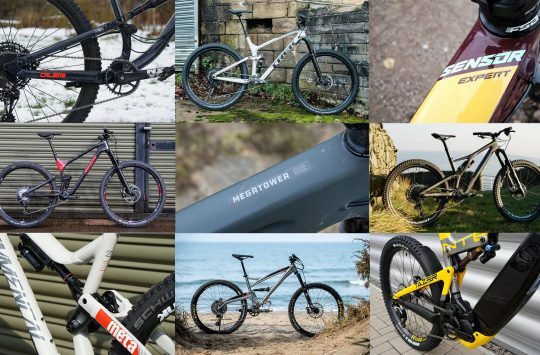 Although SRAM has received an enormous amount of interest in its 1×12 XX1 and X01 Eagle drivetrains, the reality is that for many riders and many price-point mountain bikes, the price is just a few levels too high. But if SRAM was able to introduce the same drivetrain technology with a 10-50t cassette in a significantly cheaper package, then surely it would sell by the bucketloads eh? At less than half the price of an XX1 cassette, the new SRAM GX Eagle cassette will be a popular service option. Indeed GX Eagle is THAT groupset. It brings the same technology debuted in last year’s XX1 Eagle groupset down to a price point that is not only going to be a more viable option aftermarket, it’s also going to be significantly more attainable for OEM bike companies wanting to spec a properly wide-range 1x drivetrain on their stock bikes. And with more brands looking to design 1x specific frames that are unshackled from the constraints of accommodating a front derailleur, GX Eagle represents a very viable option that allows those bike companies to spec 1×12 on a wider range of models. So how much less is GX than XX1? 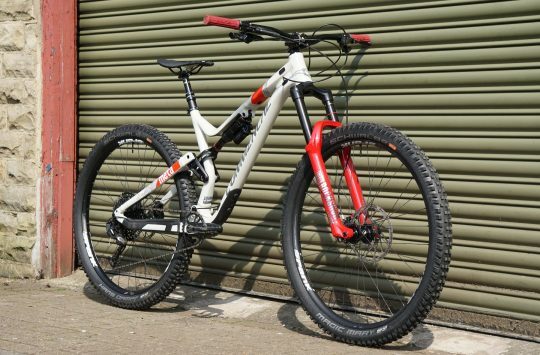 As a direct comparison, an XX1 groupset (sans BB) will cost you £1133. The new GX Eagle groupset will set you back £425 – nearly a third of the price of XX1. SRAM GX Eagle cranks with beefy forged alloy crank arms. Spiky X-Sync 2 chainring teeth. 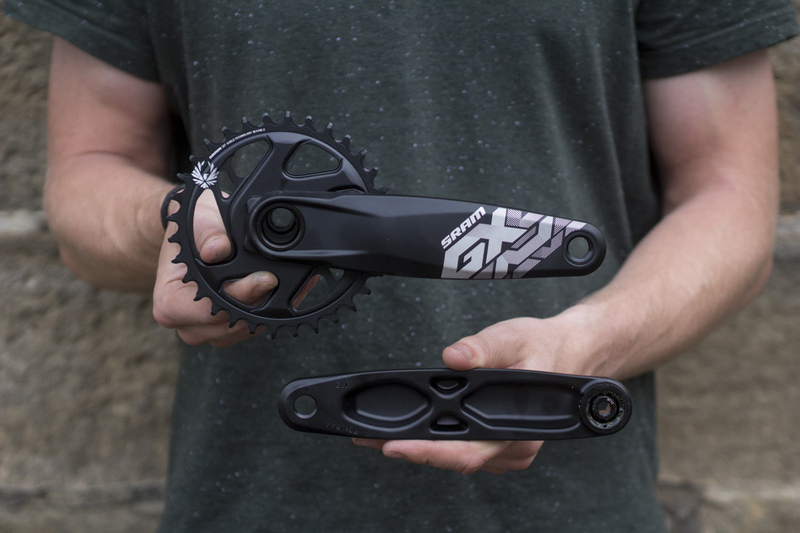 One of the areas with the biggest difference in both cost and weight to the XX1 equivalent is the crankset. Instead of fancy hollow carbon fibre arms, the new GX Eagle crankset utilises beefy forged alloy crank arms. Most importantly, it still gets a direct mount X-Sync 2 chainring, with the same Eagle 12-speed technology that’s designed to hook and grab the chain with more retention than the previous narrow-wide tooth profile used on SRAM’s 11-speed chainrings. 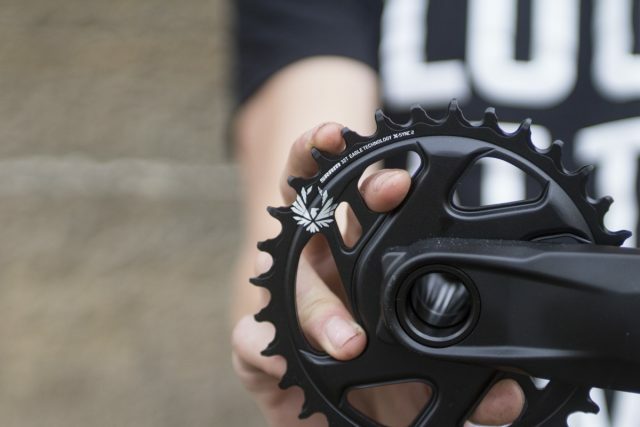 Available with 24mm or BB30 spindels to suit most bottom bracket standards, the GX cranks come in three different lengths too. The GX Eagle mech uses more steel and alloy in place of carbon fibre and titanium. Cage Lock mechanism for easier wheel removal/installation. 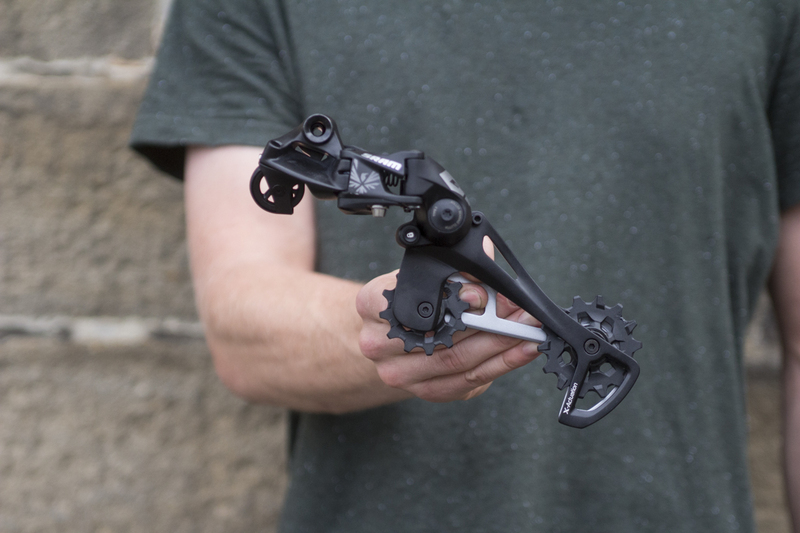 Structurally, the GX Eagle rear derailleur is almost identical to the XX1 and X01 equivalents. It’s built specifically for SRAM’s huge 10-50t cassette, with a drastically offset upper pulley that helps to clear the 50t sprocket. You’ll find less carbon fibre and titanium used in the GX mech, with more steel and alloy components helping to keep the price down. It still gets the roller bearing clutch design to keep the chain tight, and the cage lock mechanism helps to ease wheel installation and removal. 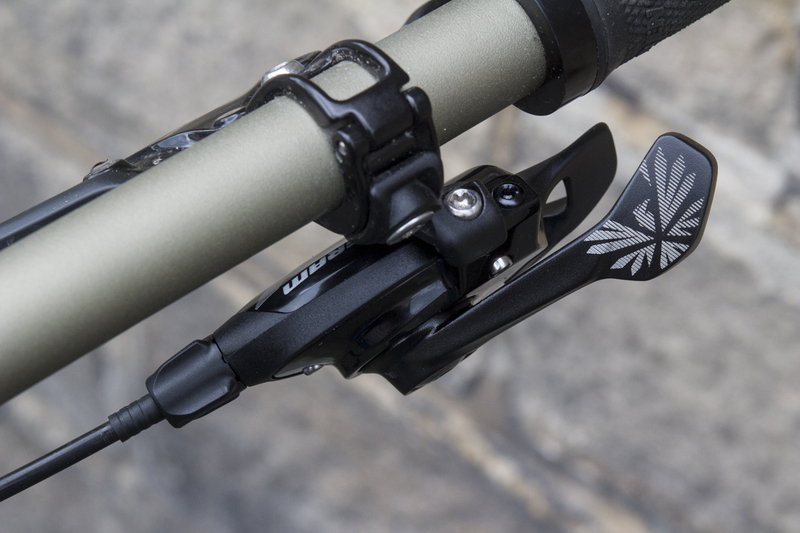 The GX Eagle trigger shifter delivers 12 snappy shifts via its thumb-only paddles. Same thumb-thumb operation, same 12 speeds, but without the exotic materials. 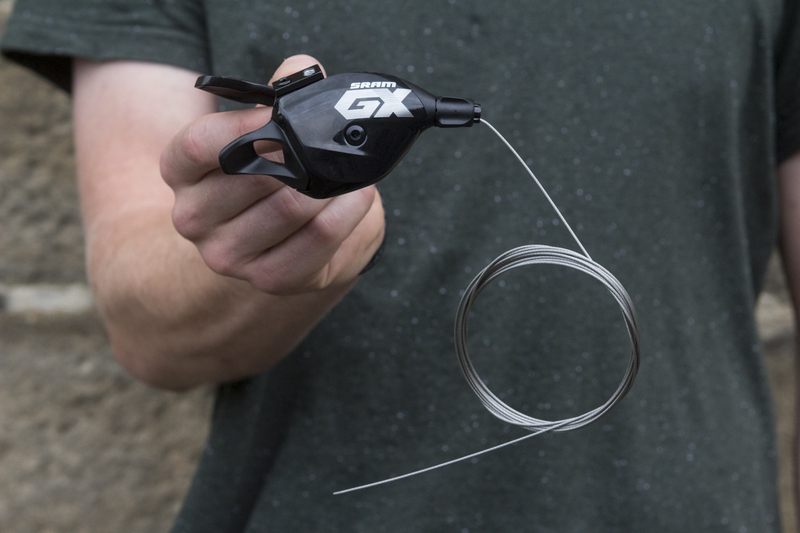 Using the familiar clamshell construction of current and previous SRAM trigger shifters, the GX Eagle unit offers similar functionality as the XX1 and X01 Eagle shifters, albeit with a change in materials. 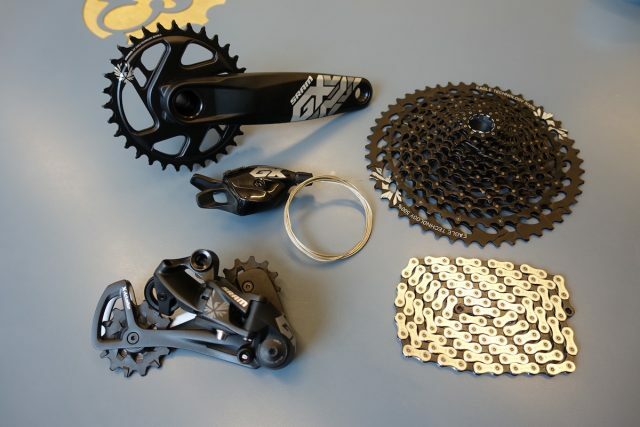 Instead of carbon and titanium, SRAM has used alloy and plastic to get the price down. The main lever is made from forged alloy, and uses a large profile thumb paddle, while the upshift lever is crafted from fancy plastic. While the GX trigger shifter doesn’t get angular adjustment of the main lever, you do get the two-position mount for positioning the shifter further inboard or outboard. It’s also Match Maker X compatible, so you can bolt it straight onto a SRAM brake lever to keep the bars nice and tidy. Also worth noting is that GX Eagle will be available with a Gripshift shifter too. The GX Eagle 12-speed chain will be just £25. 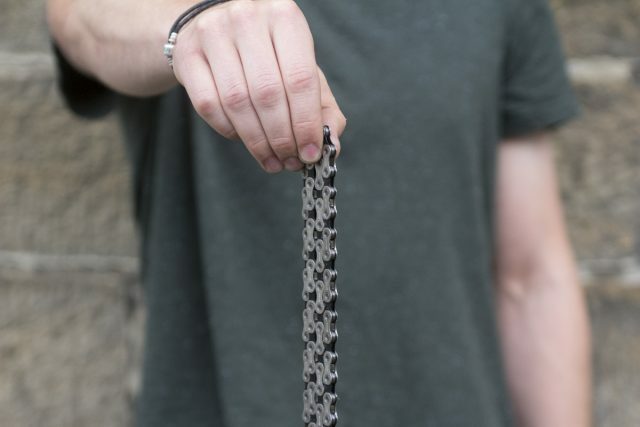 The 12-speed SRAM GX chain has been engineered to work specifically with that huge 10-50t cassette. Although you’re unlikely to get excited about a chain, existing XX1 and X01 Eagle users are going to be very interested in the GX chain. Coming in at £25 (compared to £71 for the XX1 Eagle chain), it’s designed to work optimally with SRAM’s 12-speed drivetrains, and is interchangeable with XX1 and X01. For those who maybe less concerned with the gold finish on an XX1 chain, this will be an ideal alternative for keeping the service bills low. 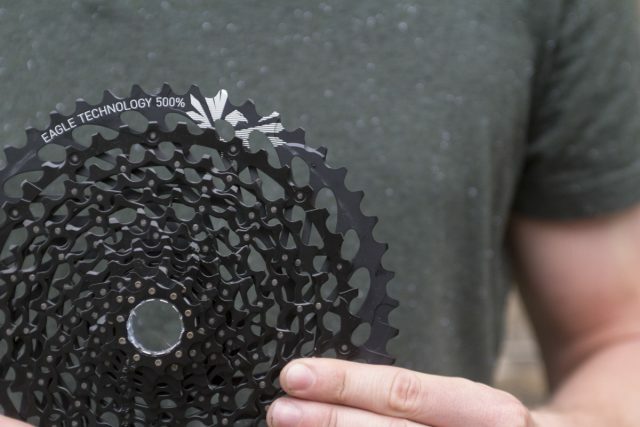 That enormous 10-50t cassette provides an unrivalled 500% gear range. Full Pin construction, with alloy for the 50t sprocket and steel for the rest. One of the most significant components of the GX Eagle drivetrain is the cassette. Using the same 10-50t ratio that the XX1 Eagle drivetrain has used to achieve an enormous 500% gear range, the GX cassette has brought the 12-speed shifting into a package that costs less than half of its XX1 sibling. 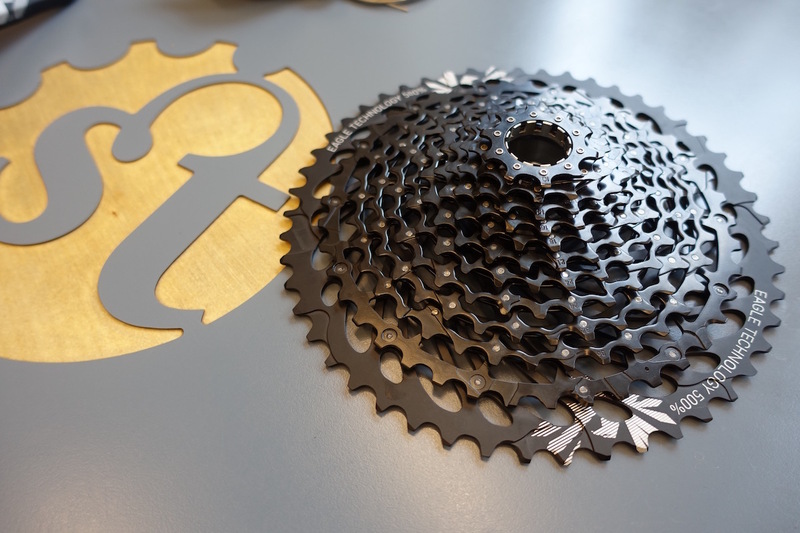 Instead of machining the sprockets from a single billet of steel, SRAM has done this by using 11 individual stamped steel cogs combined with a 50t alloy cog, which are then all pinned together to form a single unit. It’s the same construction technique used on the current GX 11-speed cassette, and while it’s still a £170 cassette, it’s a significantly cheaper proposition when it comes time to replace a worn drivetrain. 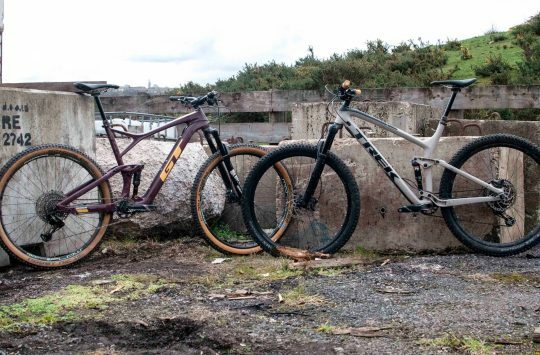 Keen to learn more about how it all works and how GX compares to the existing XX1 drivetrain? Then make sure you check out our full review of the brand new SRAM GX Eagle drivetrain. And just so I’m clear, that heavy lump of metal out back is A Good Thing, yes? £30 for a shifter seems cheap. The cost comes to £320 for shifter, mech, chain and cassette and the cassette is over 50% of the cost? Bonkers! So…. price drop time for the GX 1×11, which is enough for me TYVM. Does the crank weight include the chainring? I am currently riding the Eagle XO on my Whyte G160, absolute game changer of a groupset, so very pleased I will be able to afford replacements when the time comes.